After our night at Coral Pink Sand Dunes State Park where it was cold (-5c) but nowhere near as cold as Bryce Canyon we were in desperate need of some groceries and clean clothes. We drove the 20 miles or so to a small town called Kanab, otherwise known as Little Hollywood due to all the movies made in the area, where we found both a supermarket and laundrette. 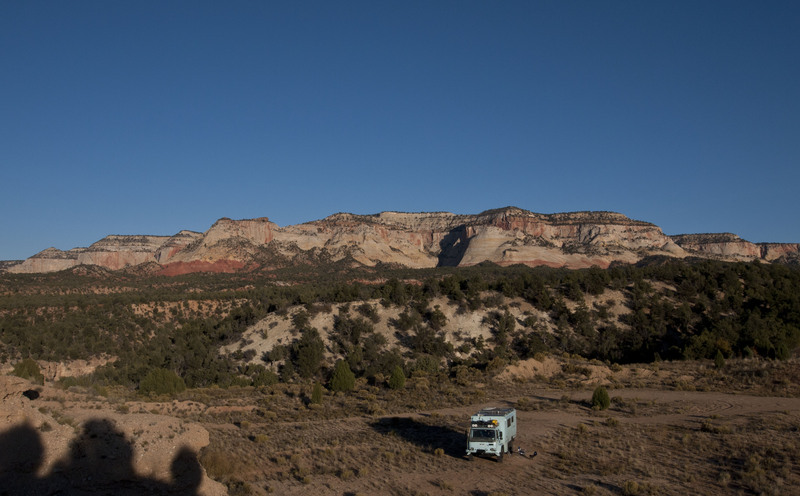 It took us the best part of the day to do our chores so when we left instead of going straight into Zion National Park we found a great free campsite about 0.25 miles from the highway down a dirt road. It was a lovely spot and was completely deserted. We knew from an already made fire ring that people had been there before us but it’s obviously not too well know as we had the whole area to ourselves for the night. 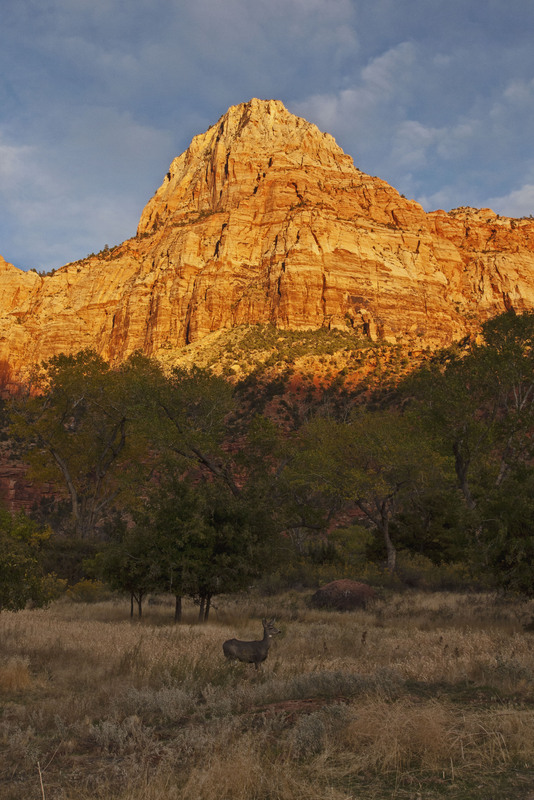 In the morning we drove the remaining 10 miles to the East gate of Zion National Park. The entrance from the East requires a drive through a 1 mile long tunnel that is quite low and not very wide. As a result we had to pay a $15 charge to have the tunnel shut to oncoming traffic so we could drive through in the centre of the road. This seems to be a bit of a con because they were only letting all traffic through one way at a time. It’s the first charge we’ve had to pay at a National Park after purchasing an Annual Parks Pass (at $80 a real bargain as entry to Parks can be as high as $25). Once through the tunnel there are some tight switchbacks to negotiate before reaching the Canyon floor. 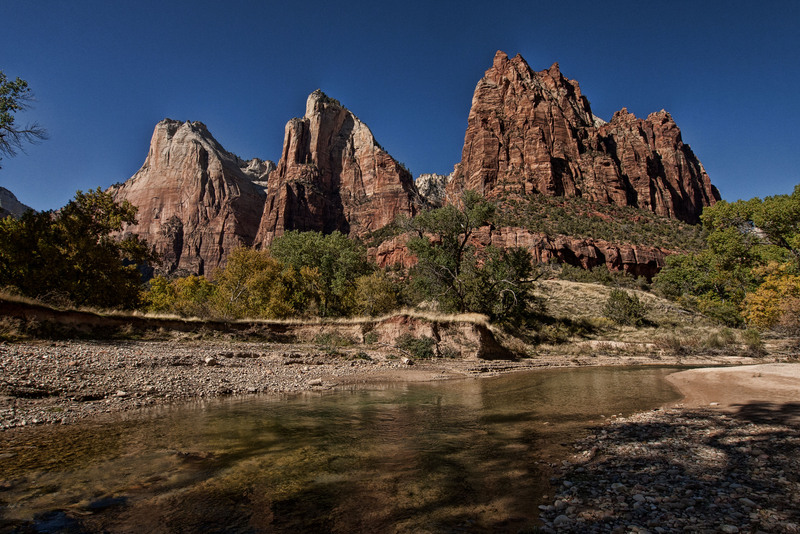 Zion is unusual for a national park in that most of it is not accessible by your own vehicle. 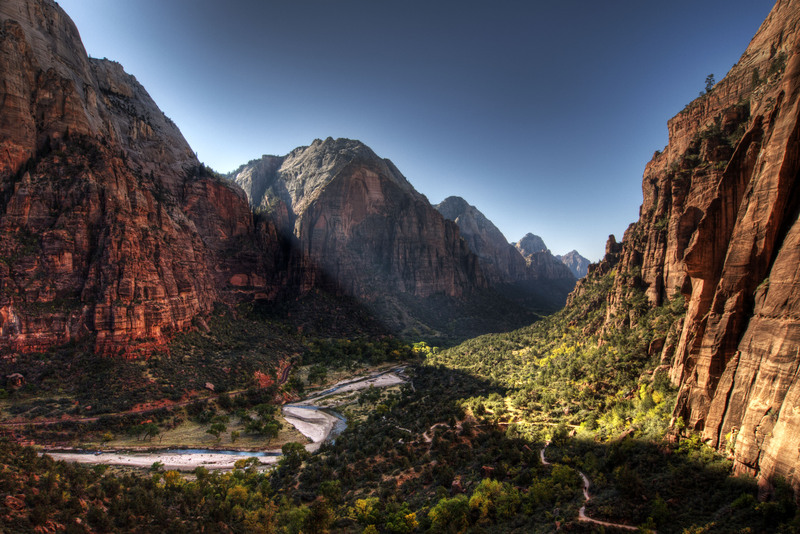 Instead there is a very efficient shuttle bus service which runs the length of the canyon. So on arriving at Zion we checked into the South Campground ($16 per night), a very leafy and shaded campground right next to the Virgin River. After getting settled we hopped on a shuttle bus and went up to the Zion Lodge stop. Here we hiked the Emerald Pools Trail (lower, middle and upper) and ended up at The Grotto. The walk was a bit disappointing as 2 of the Emerald Pools were small muddy ponds, it was also very busy. The best section of the walk was the last steep climb to Upper Emerald Pond, definitely the prettiest of the three ponds and much less crowded . After this we went to the end of the canyon and walked the riverside trail up to where the river disappears into a slot canyon – only 10 foot wide or so. You can walk up the river from here but at this time of year you need a drysuit and there were loads of people doing the hike (called the Narrows) which put us off. 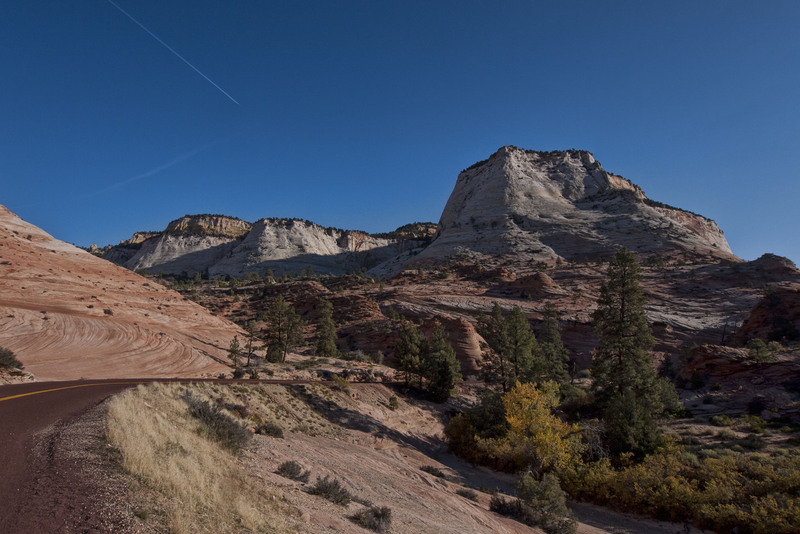 After these two trails we weren’t that impressed with Zion and returned to the Beast for a nice BBQ and fire for the evening. The next day we were up and out relatively early and jumped on a shuttle to the Grotto Stop where the trailhead for the Angel’s Landing hike is found. This hike is straight up the canyon walls up some pretty fearsome switchbacks to a small plateau called Scout’s Landing. 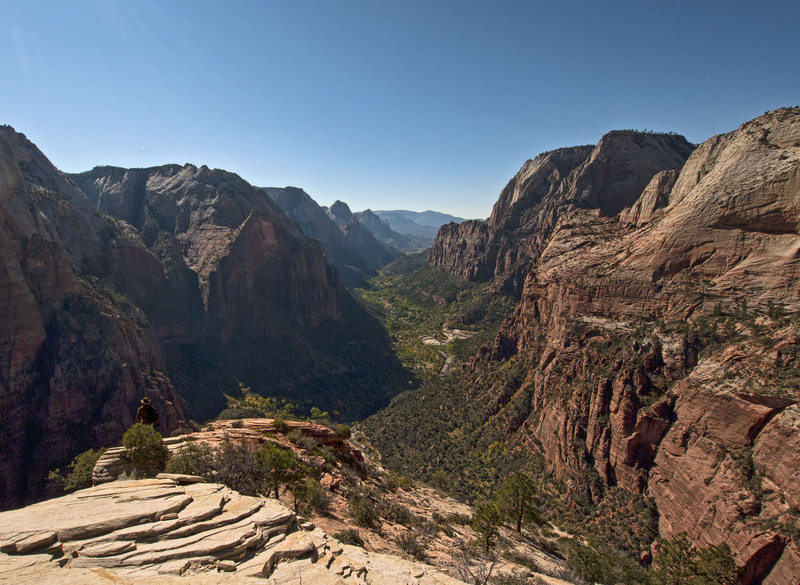 From here the path to Angel’s Landing climbs another 200m or so along a narrow ridge with 500m drop offs on each side. There is a chain embedded in the rock for some of the trail but still one slip and you would be history. The view from the top is stunning though and there is a great plateau at the end to enjoy the view. If you were scared of heights this hike would be your worst nightmare! 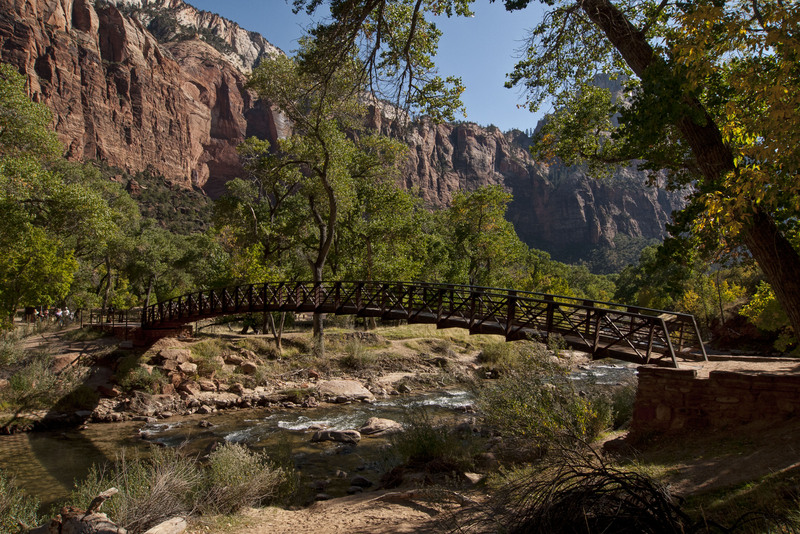 After the Angel’s landing hike (which made up for the previous days’ disappointing hikes) we took a shuttle bus to the Court of the Patriarchs (the Mormons’s became very poetic when they named things in this Park). Here we spent some time on a lovely little beach by the Virgin River with the three Patriarchs (Jacob, Abraham and Isaac) looming above us. From here we caught another shuttle to the end of the Pa’rus trail and followed this the 1.5 miles back to the campground. 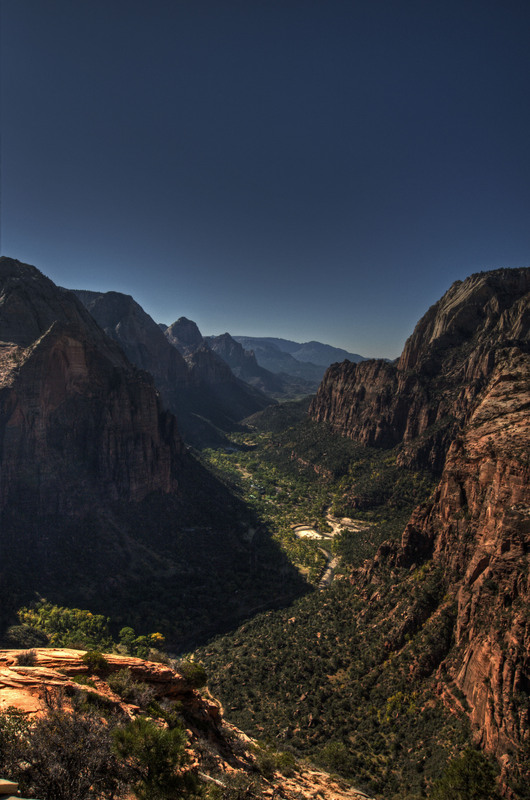 Zion is our last stop in Utah and we’re now heading for Vegas so not long now until we leave the USA and hit Mexico .